Zamfactor Ltd. Technical Art Paper no. 1. The location where the object is to be. Art work, in the classical western tradition, is made of a specific range of materials, applied by specified procedure. One key factor in the selection of these materials is permanency – art materials if well app﻿lied are to re﻿sult in a “permanent” work of art. Practically other factors also come into play such as availability, costs and technical knowledge of the artist. Many modern artists have insufficient knowledge of art materials, an issue which particularly affects the choice and application of colours. The concept of “permanency” does not feature in the ideology of many modern artists, notably as of WW II. The work of those artists is not made to last, sometimes deliberately so. The issue of material soundness, however, is a concern for buyers and collectors, especially as art usually does not come cheap or is purchased in order to be preserved. Laymen rarely have the knowledge or means to assess the material soundness of a work of art. But you may be able to see whether proper paper has been used as the support for your print, drawing, water colour or gouache. Proper art paper does not or hardly yellow. The permanency of colours is hard to establish by sight alone – when it comes to inks and pigments you depend on the artist’s consciousness and knowledge. Charcoal, black pencil and Indian ink don’t fade, but the ink of felt pen and markers do loose their original colour. The moral of this story is to carefully observe the recommendations in section 1.3 concerning the location of art you have already bought and to do some investigation on the material soundness of art you consider to buy in the future, in particular when such an object has a hefty price tag attached to it or needs preservation from a collector’s point of view. Photo 1. Same print, same edition, same age. A clear example of the use of pigments/inks that are not fast to light. 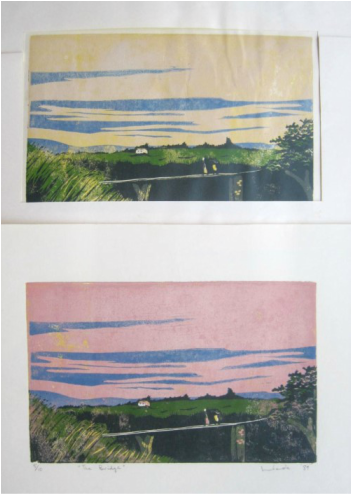 Top print faded by exposure to light, bottom print in original colour as it was kept in portfolio. Mounting board for art work is especially made board and should not be substituted by cheap ordinary board or carton. Art mounting board should be acid free and not or hardly discolour over time. The board, if tinted, should be tinted by the use of inks or solids that are fast to light; that is, do not easily fade. One purpose of the mounting board is to protect the art work from contact with the glass. If the picture has been mounted in a wobbly manner, or is wobbly by itself, this purpose might not be achieved and remounting is to be considered. The art work should be attached to the mounting board by a few drops of gum Arabic (water based glue) or by a strips of water based glue connecting mount and art work. Do not use or accept sellotape or the like as the adhesives of such materials in time migrate into the absorbent surfaces onto which they have been applied. The protective sheet of paper should be placed behind the mounted picture. The sheet should be of acid free paper, such as good plain art paper. Behind this protective sheet is the backing of the frame. A suitable backing material is masonite (see photo 3). Masonite is compressed exploded wood. It has a smooth side and a rough side that has the imprinted mesh which is part of the pressing process. The rough side should be the outside. For small pictures a good cardboard also will do. Unsuitable backings are made of cheap cardboard such as the kind of which boxes are made. Cheap yes, suitable no. The backing is tacked against the frame. 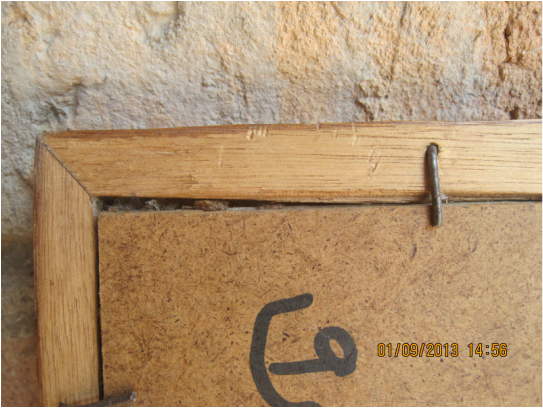 The border area of the backing and the adjacent frame should be covered by a glued strip of paper – the glue usually is fish glue – and such sealing serves to keep dust and bugs out (see photo 2). It is a good thing to do, but don’t use sellotape or similar adhesive strips. Photo 2. Frame originally made dust proof by water based glued paper tape. The paper strip tore by the contracting and expanding materials. Poor materials used. Photo 3. The gap between frame and backing allows dust, dirt and bugs in, as seen in photo 4. Photo 4. The black spots are dirt particles that crept in as the frame is not made dust proof. See photo 3. Print is mounted on paper rather than board. Your art work either is in storage or on display. We’ll first look at the on display situation. Most important about the place of display when it comes to preservation are the don’ts. Expose your picture to direct sunlight. Hang your picture close to a source of heat. Hang your picture where there are strong drafts. Hang your picture against a damp wall or in an excessively damp environment. 1). Sunlight shall cause your picture to fade when inferior pigments or inks are used and may eventually also cause durable pigments or inks to fade or change colour. This point is drama﻿tically demo﻿nstrated in photograph no 1. Fading is accelerated by the use of poor colouring agents, as in this case. Exposure to sunlight may also cause other problems by the differential absorption of warmth by light and dark area’s with white areas staying cool and dark area’s warming up. Such temperature variations cause differences in expansion or contraction across and within the picture, and results in local variation of in humidity as well. These factors contribute to the gradual destruction of your work of art. 2). Art work should not be placed close to illuminating light bulbs as these shall warm up the object. The art work should have normal room temperature and generally abrupt changes in temperature should be avoided. Art work should not be hung in a spot with excessively varying temperatures, such as close to a fire place or other source of heat. 3). Drafts bring about changes in temperature and/or humidity and transport dust that may settle on or in your picture. Not good. 4). A humid wall or prolonged exposure to excessively humid air shall transfer humidity onto and into your frame and picture. Humidity shall cause fungi to thrive on your art work. In that event you need to open the frame, take out the picture to dry up and free it of dust by the use of a soft brush. It is best to consult an expert if the picture is valuable. The mount, protective sheet and backing must be replaced if affected. The frame must be thoroughly cleaned and dried. Humidity also promotes undesirable mechanical and chemical action and reaction. Art purchased as a print, drawing, watercolour or gouache usually is kept in a portfolio; with protective sheets of good paper between them, or, better mounted on quality board The works are better mounted as this leaves the surface free of contact with other materials. Collectors may store in special drawers. The main dangers are excessive humidity and sometimes insects. Periodic inspection is necessary – you’ll be surprised how easily dust and bugs find their way into your art collection! These objects best are kept in a vertical position to reduce the chance of breaking the glass. The main requirement is to store the work in a reasonably dry place. In tropical area’s one must be mindful of termites. Inspect periodically – once or twice a year.